The Center's long running film-series is back! Join us for our first screening of the season. This event elevates a legacy of community resistance to the discriminatory and environmentally destructive presence of the oil, gas, and chemical industry in Louisiana. Today’s fight in Cancer Alley, led primarily by Black women living in communities inundated with chemical plants, tank farms, and refineries, is on the front line of the national and global movement to combat climate change and environmental racism. Join us as these community leaders announce their demand for a total moratorium on new industry plants in their region and a closure of existing plants. Learn how you can support these calls for an end to the destruction of their communities and consider ways we can uplift our collective vision of environmental justice. 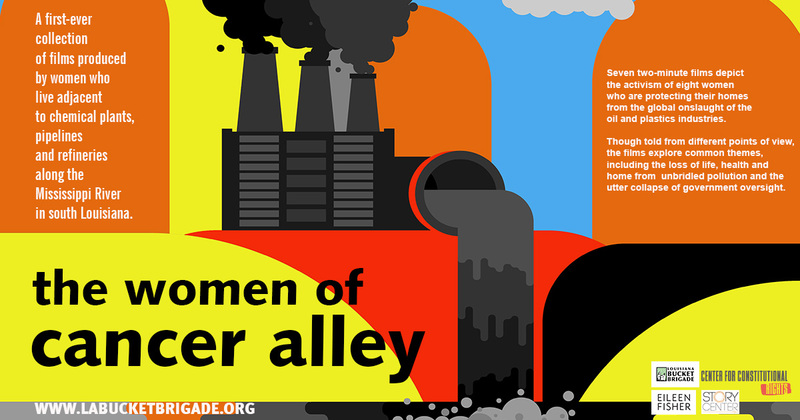 "The Women of Cancer Alley" is a ground-breaking collection of short films produced by women who live among chemical plants, tank farms, and refineries in the area along the Mississippi River known as 'Cancer Alley', in south Louisiana.